When it comes to denim GT are particularly fussy. With this in mind we decided to write a post about our favourite brand of jean for quality, cut and denim. When it comes to a consistent quality you can’t go wrong with Japanese label Edwin Jeans, their range beats stalwarts such as Levi’s for both style and quality and also features our favourite cut the tapered leg ED-55. So that is the brand and the cut but what about the type of denim? Having owned several pairs of ED-55 jeans we find the best denim to be the rainbow selvage denim in 16oz weight. Selvage denim often called Selvedge is traditionally a heavier cotton twill fabric woven on looms in which one yarn (the weft) passes under two or more lengthwise (warp) threads producing the familiar diagonal ribbing you often notice. GT like the 16oz (weight of a square yard of denim) denim because it is thick enough to hold the ED-55’s tapered leg shape without being too thick for warmer weather. To give you some idea of where our recommended weights sits; regular jeans are usually 8 to 12 ounce and really thick jeans can go up to 32 ounce. By nature Selvage denim is not typically supposed to be machine washed or tumble dried from new; this is to retain the integrity of the denim and prevent the blue indigo dye from fading for as long as possible. Above all the main reason we recommend selvage is simply because the denim actually gets better and better with age becoming more comfortable and developing a natural fade which enhances the jeans in a far more appealing manner than stone washing. 1. 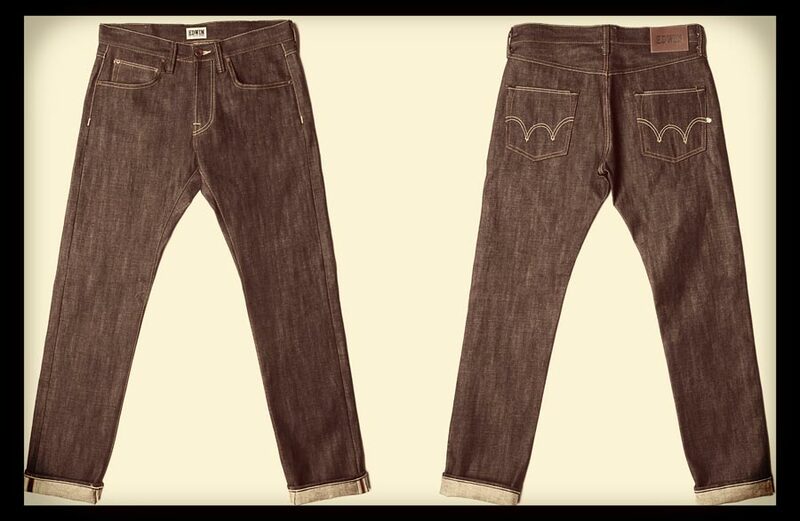 Start with a pair of raw Edwin denim jeans. 2. Wear your jeans everyday for at least 6 months. Anything up to a year and they will continue to acquire the history and character you imbue with them, any more than that and you may start to notice disintegration. 3. If you need to remove any stains, dab with a damp cloth, remember no detergent. 4. To freshen up your jeans at any point, hang them outside for as long as is necessary, bu don’t leave them out in the rain as the indigo dye will bleed out. 5. When, at last you finally have to wash your (by now) well worn jeans, Edwin suggests turning them inside-out and running a 40˚C cycle without detergent. When they’re done and whilst still damp, stretch the inseam back to it’s normal length and line dry, never tumble. 6. Finally, wear your jeans for another 3 months then wash at 30˚C with your regular non-bio detergent as this will help prevent fading. Now you can wear and wash your jeans as needed. You can visit Edwin’s London store which also has a free in-house alterations service or purchase online here from Edwin European. A couple of interesting denim facts for you: Denim is originally from Nimes in France produced by a family called Andre; known then as Serge de Nimes later shortened to denim. The blue dye used in denim comes from a plant called the Indigofera plant hence the colour indigo. A top GT tip is to place your jeans in a freezer overnight if they become particularly dirty, this helps to remove dirt and naturally kills any germs. They are fantastic jeans but it’s a shame that Edwin have decided to lose the little white ‘E’ tab on their jeans. I can’t see Levi’s losing their red tab or Nike removing their swoosh.